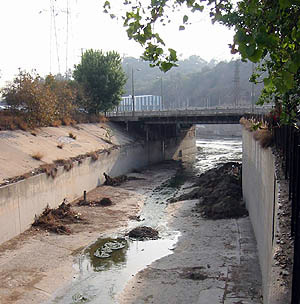 Nathan Baird-Hu has prepared this interesting video voyage which shows off the confluence of the Arroyo Seco and the Los Angeles River. The video journey takes you through the bushes into the channel near San Fernando Road, right by where the Arroyo Seco Parkway (aka Pasadena Freeway) and the Golden State Freeway cross. Then Nathan takes you right up to the confluence itself. The ominous noise results from cars crossing the 19th Street Bridge, but listen to the birds in the background as you approach the Los Angeles River. That's Elysian Park on the other side of the river, with downtown LA a mile to the south (left). Just click twice on the button to start your journey to the Confluence. ". . . one of the most hopeless and hopeful spots in LA . . ."